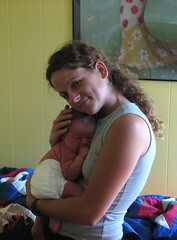 Tannis posted Ezra's birth story already -- it's thorough and funny and gives me teary goosebumps. Superpowers, I tell ya. For anyone who missed them (and finds these things interesting) she also wrote Ella's and Ivy's birth stories a while back. I revere these written records as precious family heirlooms...and everyone else gets to see them too. Update: Since I posted this, I've been meaning to add this photo of Barbara, our dear friend and incredible midwife...so there she is. Barb's been our support and primary caregiver in the births of our three children; an integral part of the story of our family. She's got superpowers of a different kind...and she's also a kindred spirit.